It is important to remember that the benefits of immunisation far outweigh the risks. Immunisations in Fiji begin at birth and are free for your Child. Getting your child Immunised at the recommended times will give them the best protection against diseases, your doctor or Nurse will give the immunisations to your baby. Immunisations come in the form of either an injection or are taken orally. Why does my child need Immunisation? In the past, diseases such as diphtheria, tetanus and whooping cough killed many children. Today, we use Immunisation to immunise children against these and other diseases. Immunisation has wiped out some of the killer diseases of childhood around the world and in Fiji. These diseases are no longer commonplace in Fiji thanks to immunisation (although it can still occur in children who haven’t been immunised). In Fiji, the immunisation rate still hovers around 95% which means that around 5% of the population is still not immunised and so are susceptible to these diseases. Immunisation is the most effective way to protect your child from preventable diseases. Our body’s immune system is very clever and protects us from sickness and disease using small molecules called ‘antibodies.’ The first time your body encounters a new germ, these antibodies can take a while to swing into action, so we get sick as our immune system fights the germs off. Our immune system is very good at remembering, so the next time we come across that same germ, our immune system has a much better response prepared, so it is faster and more efficient at mounting a defense. In very young children, their immune system is not as developed or experienced in fighting infections and responding to germs as an adults and so they can be more vulnerable to diseases. Immunisations work by introducing our body to a version of the dangerous germ, that won’t cause disease, but helps our immune system to respond to this harmless version so that if it is ever faced with the more dangerous version, it already has the knowledge to respond quickly to real infection and protect us. 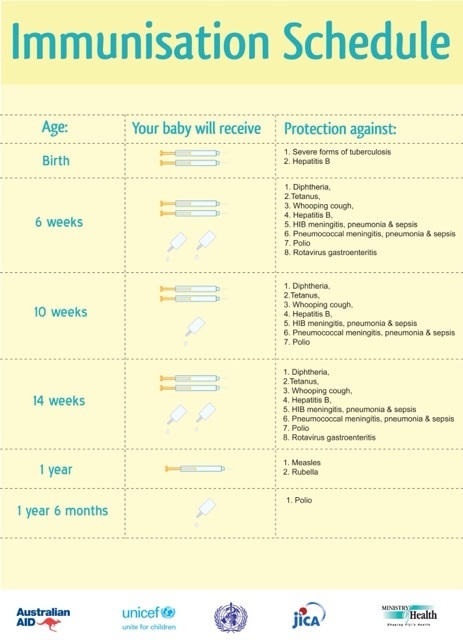 Many of these immunisations require more than one vaccine, so it is important to follow the immunisation schedule as timing often plays a role in immunisation. These diseases / infections have been chosen for immunising against because they are among the most dangerous to our children and because Fiji has effective vaccines available against them. The Hepatitis B vaccine was only introduced to Fiji’s immunisation schedule in 1989 and so if you were born before 1989, you are very likely still vulnerable to the virus. Hepatitis B is spread from human to human and there is no cure once the virus is contracted, the best protection against Hep. B is to get immunised. You can learn more about Hepatitis B in our conditions & treatments section. All Ministry of Health staff are immunised against Hepatitis B as well as medical students at the Fiji School of Medicine and Nursing. If you were born before 1989, you should speak to your Doctor about getting immunised. Visit your local doctor or maternal child health clinic to stay up to date with immunisation. Some will also be administered at hospital straight after birth. 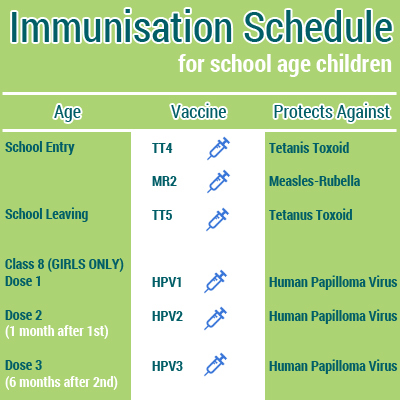 School age children should get their vaccine through school.